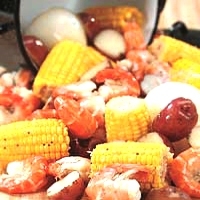 Bring the taste of New Orleans with our On-Site Shrimp Boil of fresh shrimp, boiled potatoes and corn seasoned to make your guests feel the sweet heat of the low country. Unique and savory shrimp will have them licking their fingers with delight. Cool them down with our fruit smoothies at no extra charge!